The Mount Bogong expedition takes you on a journey, through diverse landscapes, along a route that highlights the vertical scale of the Victorian High Country. Starting in the rich fertile valley of the Kiewa River, the tracks climb gently through the ferny mountain forests to a pretty streamside camp. Next morning with a wisp of campfire smoke curling through the morning mists, the horses are prepared for a day of climbing into the high alps. Leaving behind the lush temperate rainforest the mighty woolly-butts stand tall over our little horse team as it winds on, climbing eventually into the snow gum woodlands and finally the open herb fields of the High Plains. The blue ridges extend to the horizon, hazy with eucalyptus vapors across hundreds of kilometers. Beyond the dome of Mount Nelse is our sheltered camp at Cemetery Spur or perhaps Kelly’s Camp. Over the following days, the expedition continues to reveal new and different landscapes, along with heritage tracks built on the hopes and dreams of gold miners and distant views of surrounding mountains. The final camp is in the tree-line on Mount Bogong, Victoria’s highest mountain. On your last day, you climb to the highest place you can take a horse in Australia, and nestled in the valley far below is Spring Spur, your destination at day’s end. 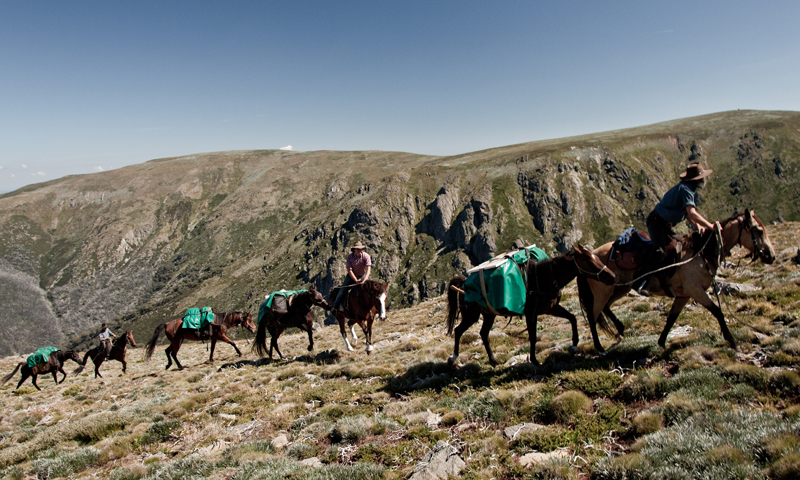 Bogong Horseback Adventures’ pack horse expedition program commences annually in the late spring when the peaks of the Victorian High Country shake off their winter snows and alpine life starts to stir. For thousands of years the Aboriginal peoples of the surrounding country embarked on their annual migration to the High Plains, and until recently the mountain cattlemen, following their time-honored ways pushed their cattle up to the 'tops'. Along with gold seekers, bushrangers and early adventurers, they all helped create a rich heritage, woven into the rugged fabric of the High Country. Much of the High Country remains un-roaded today, and packhorse expeditions offer a traditional and practical means of exploring this vast landscape. The horses are a feature of this expedition, each of them our own bred and trained mountain horse, expertly matched to the rider. Each day the camp is packed up, loaded onto the packhorses and the journey continues. 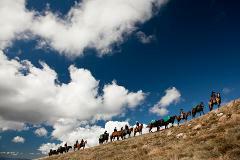 Riding is between 15 to 25km per day with opportunities for loping canters across open plains. Camps are selected for their beautiful settings, some in traditional stock camps featuring huts, but often secluded bush camps maintained by Bogong Horseback Adventures. With swags rolled out dinner is prepared and enjoyed around a warming fire, with a cold beer, a local wine and a meal prepared from local fresh produce on the coals. All expeditions include a night before and a night after at Spring Spur, where you can join the family for a meal and enjoy your comfortable en-suite room. Arrive on Saturday 8th February and finishes on Friday 14th February 2020. Pre-ride information, horsemanship basics in the yards at BHA and packing check. Ride following the East Kiewa River track to our camp at Bogong Creek. Climb up to the High Plains via Timms Spur, a traverse of Mount Nelse and onto camp at Cemetery Spur or Kelly’s. Follow the hand cut Track 107 down to an early camp on Big River in the Mount Wills Heritage Area. We ascend Mount Bogong via the Long Spur, a full day of riding the ridge up to our camp below the tree line near Cleve Cole Hut. Traverse the magnificent Mt Bogong before descending the legendary Eskdale Spur to the head of Mountain Creek returning back to Spring Spur Stables.